San Antonio previously hosted the Women's Final Four in 2002 and 2010. (Sept. 25, 2018) -- San Antonio was named host city for the 2021 NCAA Women’s Final Four, the NCAA Division I Women’s Basketball Committee announced this week. The Women’s Final Four will return to the Alamodome for the third time on April 2 and 4, 2021. The Alamo City previously has hosted America’s premier women’s sporting event in 2002 and 2010. UTSA will co-host the 2021 event with Incarnate Word and San Antonio Sports. The 2002 national championship was won by UConn, which defeated Oklahoma in the title game. 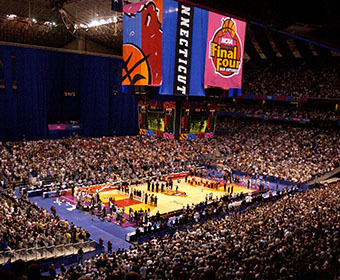 The Women’s Final Four all-time attendance record was set in 2002 with 29,619 in attendance for the national semifinals. The 2010 Women’s Final Four in San Antonio also was won by UConn behind most outstanding player Maya Moore. The Huskies, with a 39-0 record, defeated Stanford for the national title. San Antonio was one of four cities tabbed as future host cities, joining Minneapolis (2022), Dallas (2023) and Cleveland (2024).